Overuse injuries of the leg are a common problem for young soldiers. This article reviews the literature concerning the prevention and treatment of exercise related leg pain in military settings and presents the latest developments in proposed mechanisms and treatments. Current practice and treatment protocols from the Dutch Armed Forces are reviewed, with an emphasis on the most prevalent conditions of medial tibial stress syndrome and chronic exertional compartment syndrome. The conclusion is that exercise related leg pain in the military is an occupational problem that deserves further study. Overuse injuries of the legs are a common problem in occupations that involve repetitive lower limb activities, such as the military. 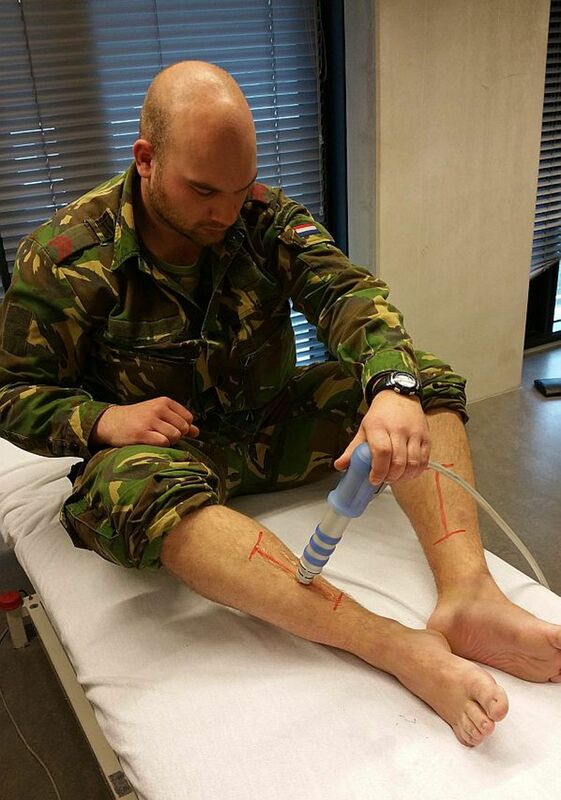 The most common diagnoses of young Dutch soldiers with ERLP are medial tibial stress syndrome (MTSS), chronic exertional compartment syndrome (CECS) and a combination of MTSS and CECS. New elements in the conservative treatment of ERLP in a secondary care setting are extracorporeal shock wave treatment for MTSS and gait retraining for CECS. Despite a growing body of knowledge, overuse injuries of the legs continue to have a high incidence, long recovery time and large impact on military training. MTSS and chronic exertional compartment syndrome (CECS) are the two most common types of ERLP of young soldiers in the Dutch military.7 In contrast to American and British military literature, stress fractures to the tibia are extremely rare in the Dutch armed forces and there is no clear explanation as to why.9 ,10 It is assumed that American and British recruits do more running, in shorter training courses, whereas Dutch recruits do more marching and their training courses are, on average, longer. The highest reported incidence of MTSS in a military setting was 35% of 124 naval recruits participating in basic military training (BMT) in Australia;4 CECS occurred in US Army soldiers at a rate of 0.49 cases per 1000 person-years (4100 cases diagnosed in 5 years).11 The relative risk for young female soldiers to sustain an overuse injury is 2.5 in the Dutch military6 and the relative risk for young female soldiers to sustain an overuse injury in the ERLP category has been reported between 1.11 and 3.1 (Table 1). This article reviews the literature concerning the prevention and treatment of ERLP in military settings and describes the current practice of ERLP care in the Dutch military. A comprehensive search was conducted that included MEDLINE (PubMed) for articles in English that were related to ERLP in the military, using the following (truncated) search terms in different combinations: MTSS, CECS, ERLP and military. The latest consultation of Pubmed was December 2015. The intention of this article is to assist healthcare professionals to better help military patients. There are no prospective studies that determine which of the ERLP risk factors reported in Table 1 are most relevant in the Dutch military. Based on a consensus meeting of senior physicians the following five risk factors are deemed most important in the Dutch military setting: current status (injured at the time of medical examination), a history of ERLP, technique of running and marching, female gender and little prior weight-bearing physical training (defined as: several years of participation in a sport with leg loading such as soccer, track and field, basketball, etc). If a recruit has several risk factors for the development of ERLP, particularly the five identified above, the physician performing the initial medical assessment can take the following preventative measures: (1) The recruit will be assigned a military job where running and marching is of less importance, (2) The recruit is temporarily denied access to the military to heal and to work on modifiable risk factors or (3) The recruit is denied access to the military permanently when the risk profile for ERLP is particularly unfavourable. Following the initial medical assessment, the most important factor to prevent injury in military training is a carefully graded increase in physical loading as the literature clearly shows a relationship between weekly training volume (especially running and marching) and the number of injuries to the lower extremity.48–53 The training load must be compatible with the physical abilities of the recruit. The most common diagnoses in young Dutch soldiers with ERLP are MTSS, CECS and a combination of the two; pain from fascial herniae, tibial stress fractures, peripheral nerve impingement (eg, the superficial peroneal nerve) and ACS caused by exercise are all much rarer. The Running Leg Pain Profile (RLPP): 1. lateral side right leg; 2. medial tibial border right leg; 3. medial tibial border left leg; 4. lateral side left leg (calves, region 5 and 6, optional). Table 2 shows the current treatment guideline based on expert consensus for ERLP in the Dutch Armed Forces. It is not necessary to perform an IMCP measurement before starting conservative treatment for ERLP. The treatment must offer the components presented in Box 1. 5. Goal evaluation: is it realistic for this soldier to return to the intended military training and or job? In the Dutch military, the base physician is responsible for starting the treatment of ERLP and ensuring the timelines are adhered to (Table 2). The physician refers the patient to the physical therapist if the initial actions of the guideline are insufficient to reduce the symptoms and invites the patient to return for monthly visits to discuss treatment progress. The treatment programme on base that should lead to return to full duty is divided into two physical therapy phases, a sports phase and a military-specific phase. The transfer from one phase to the next is based on objective test results, such as a pain-free 12 min run is one of the requirements to enter the sports phase of rehabilitation. The physician on base may refer the military patient to secondary care in a regional military hospital if treatment of the soldier with ERLP in accordance with the guideline (Table 2) stagnates. Based on consensus of senior physicians, it is recommended to do this after approximately 3 months of conservative treatment. Traditionally Dutch military personnel with overuse injuries of the legs and suspected CECS are sent to the out-patient clinic of the department of general surgery of the Central Military Hospital (CMH). Over the last 20 years, the number of new patients visiting the clinic for ERLP has been constant at 250 per year and until recently approximately 150 fasciotomies per year were performed. In the current protocol the soldier with ERLP meets with three physicians in one hospital visit: a surgeon, a primary care sports medicine physician and a physiatrist. The RLPP is recorded and an IMCP measurement is performed in all compartments where the patient has symptoms, in both legs, even if the patient has unilateral symptoms. With the Stryker pressure monitor (A) the anterior compartment (B) and the deep posterior compartment (C) can be reached penetrating the skin only once. Most treatment actions reported in Table 2 have been in use in the Dutch military for many years and are considered ‘standard therapy’. New elements in the conservative treatment of MTSS in a secondary care setting are extracorporeal shockwave treatment (ESWT) and gait retraining. Two studies report that patients with MTSS who receive a standard treatment programme plus ESWT have better outcomes than those who receive the standard treatment only.91 ,105 ESWT treatment on the tibia can be quite painful. In the Dutch military setting, ESWT treatment is available in the primary care sports medicine department only, using a protocol adopted from Rompe et al105 (one session per week, 2000 radial shocks, 8 shocks per second, 2.5 bars of pressure, four or five sessions in total). Practical experience has shown that patients strongly prefer self-administration of ESWT on the tibia (Figure 3). Gait retraining to change running biomechanics can reduce the vertical forces of landing significantly122 with the most important factors in reducing the impact forces of running being a change from a rear-foot to a mid-foot strike103 and increasing cadence, usually through decreasing stride length.123 There is no study that reports the results of gait retraining as a treatment for MTSS. Self-application of extracorporeal shockwave treatment, a soldier with medial tibial stress syndrome. In the Dutch CMH, no surgical treatment is offered if the diagnosis is MTSS, because the results reported in the literature are poor:127 patients report reduction of pain after surgery, but only 41% fully return to the presymptom level of sports participation. Until a few years ago, fasciotomy of the affected compartments seemed the only useful treatment for CECS.128–130 In the Dutch CMH, Verleisdonk et al reported that after minimally invasive fasciotomy of 151 compartments in 81 patients (149 anterior compartments and two lateral compartments) 76% of patients experienced significant reduction of pain 6 months after surgery. The average compartment pressure was reduced from 57 mm Hg preoperatively to 25 mm Hg postoperatively.131 In 10 cases however, pressures were not reduced postoperatively, four patients (4.9%) had surgical revision and there were four documented complications (three neuromas and one seroma). Complications of fasciotomy reported in the literature include perioperative vascular damage, haematoma, neurological complaints, damage to the superficial peroneal nerve, deep venous thrombosis, delayed wound healing, postsurgical hernia, persistent ankle pain and cosmetically unacceptable scars.33 ,132–135 The highest reported rate of complications is 15.7%.132 The rate of complications in the Dutch CMH is unknown, but the surgeons indicate that the number of complications of surgery rises with the number of compartments opened during one surgical procedure. Long-term complications of fasciotomy are not well documented. Based on these insights, the Dutch CMH has changed its policy for surgery for CECS. Fasciotomy is performed only after at least 3 months of conservative treatment, as described in Table 2; preoperatively it is ensured that patients have received gait retraining and that creatine supplementation had been terminated.87 ,88 The number of fasciotomies being performed in the Dutch CMH is declining. The body of knowledge on ERLP in the military is growing and the number of publications is increasing. Despite these recent developments the occupational problem of ERLP in the military is far from resolved. These overuse injuries continue to have a high incidence, long recovery time and large impact on training. Proactive preventative and rehabilitative management targeting ERLP is necessary to achieve change. The challenge is to convey the current knowledge and the sense of urgency to all physicians and policy makers involved.
. Compression sleeves 2: the effect on running performance in 100 soldiers with exercise related leg pain. Nederl Mil Geneesk T 2013;66:11–17.
. Evaluation of the rehabilitation of soldiers in basic military training. Nederl Mil Geneesk T 2005;58:47–56.
. The remedial platoon of basic infantry training. Nederl Mil Geneesk T 2008;61:21–4.
. The treatment of soldiers with MTSS and CECS. Nederl Mil Geneesk T 2014;67:72–82.
. Prevention of recurrent injuries in pre-military high school students. Masterpiece Sport, Hogeschool Eindhoven, 2013.
. Studying the relationship between medial tibial stress syndrome and anatomic and anthropometric characteristics of military male personnel. Asian J Sports Med 2016;6:e23811.
. The effect of foot structure and range of motion on musculoskeletal overuse injuries. Am J Sports Med 1999;27:585–93.
. Injuries and injury risk factors among British army infantry soldiers during predeployment training. Br J Sports Med 2011;17:381–7.
. A review of lower limb overuse injuries during basic military training. Mil Med 1993;158:410–20.
. Chronic exertional compartment syndrome: correlation of compartment pressure and muscle ischaemia utilizing 31P-NMR spectroscopy. Clin Sports Med 1993;12:151–65.
. Bilateral lower extremity compartment syndrome and anterior tibial stress fractures following an Army physical fitness test. Medscape J Med 2008;10:82.
. Acute exertional compartment syndrome occurring after performance of the army physical fitness test. Orthop Rev 1994;23:749–53.
. The anterior and the lateral compartment syndrome of the leg. PhD Thesis, Utrecht, 1968.
. Clinical aspects of lower leg compartment syndrome. PhD Thesis. Utrecht, 2004.
. Management of chronic exertional anterior compartment syndrome of the lower extremity. Clin Orthop Rel Res 1987;(220):217–27.
. Association between ambulatory physical activity and injuries during United States Army basic combat training. J Phys Act Health 2011;8:496–502.
. The incidence of overuse injuries in military recruits during basic military training. Mil Med 1994;159:421–6.
. Effect of rest from running on overuse injuries in army basic training. Am J Prev Med 2008;18(Suppl 3):147–55.
. A randomized trial of preexercise stretching for prevention of lower-limb injury. Med Sci Sports Exerc 2000;32:272–7.
. A prospective study on the management of shin splints. J Bone Joint Surg Am 1974;56:1697–700.
. Does calcium supplementation prevent bone stress injuries? A clinical trial. Int J Sport Nutr 1992;2:165–74.
. A review of chronic exertional compartment syndrome in the lower leg. Med Sci Sports Exerc 2000;32(Suppl 3):S4–S10.
. Developments in the treatment of chronic exertional compartment syndrome. Nederl Mil Geneesk T 2012;65:160–2.
. Exercise related leg pain: neurological perspective. Med Sci Sports Exerc 2000;32(Suppl 3):S11–14.
. Biomechanical overload syndrome: defining a new diagnosis. BMJ 2014;48:415–16.
. Changes in lower leg anterior compartment pressure before, during and after creatine supplementation. J Athl Trai 2002;37:157–63.
. Exercise related leg pain caused by plantar hypertonia. Sport Geneesk 2012;2:22–5.
. Chronic exercise related leg pain in soldiers: new findings in the soft tissues? Nederl Mil Geneesk T 2013;66:92–9.
. Strenghtening the dorsal flexors in MTSS. Nederl Mil Geneesk T 2011;64:146–51.
. Core-stability training for MTSS. Sportgericht 2010;64:31–7.
. Jumping ahead! Building up jumps in MTSS. 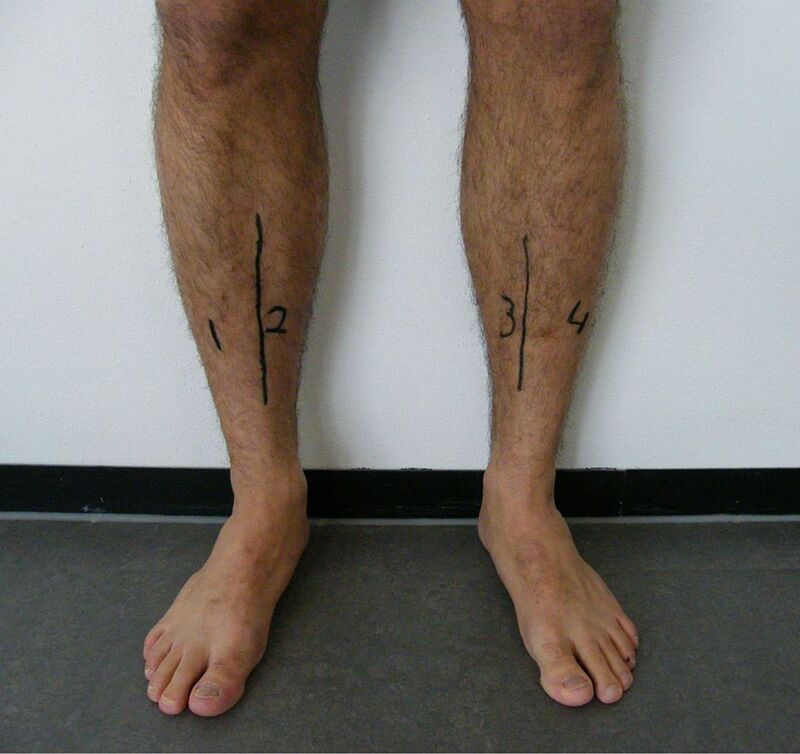 Sportgericht 2010;64:10–15.
. Tibial stress syndrome. Geneesk Sport 1978;11:56–68.
. Invasive compartment pressure testing for chronic exertional compartment syndrome: a survey of clinical practice among military orthopedic surgeons. Am J Orthop 2015;44:E384–389.
. Chronic exertional compartment syndrome. PhD thesis. Utrecht, 2000.
. Exertional tibialis posterior compartment syndrome. Clin Orthop Rel Res 1986;(208):61–64.
. The ankle-arm index before and after exercise in normals and soldiers with exercise related leg pain. Nederl Mil Geneesk T 2015;68:44–9.
. Gait re-training to alleviate the symptoms of anterior exertional lower leg pain: a case series. Int J Sports Phys Ther 2015;10:85–94.
. Influence of the running shoe sole on the pressure in the anterior tibial compartment. Acta Orthop Belg 1995;61:190–8.
. Outcome of surgical treatment of medial tibial stress syndrome. J Bone Joint Surg Am 2003;85A:1974–80.
. Goede resultaten van fasciotomie bij het chronisch compartimentsyndroom van het onderbeen. Ned Tijdschr Geneesk 1996;140:2513–17.
. Exertional compartment syndrome: review of the literature and proposed rehabilitation guidelines following surgical release. Int J Sports Phys Ther 2011;6:126–41.
. Post-surgical rehabilitation following fasciotomies for bilateral chronic exertional compartment syndrome in a special forces soldier: a case report. Int J Sports Phys Ther 2013;8:701–15. Contributors WOZ is the main author and guarantor of this review article. Important contributions in content, grammar and style have been made by PHH and AB.